Fire extinguisher in the house, fire extinguisher in the room. Does it make any scenes to disturb visual harmony of the room by this quite inaesthic thing? For the beginning it’s reasonable to tell yourself that this red and ridiculous thing is important element of fire safety protection of the house which is probably the only one chance to prevent the dawn of the fire, to prevent an accident. Carbon dioxide type fire extinguisher in each room is not a freak or imposed opinion but secure instrument for your life and your property. In case of inflammation every second will count: water flows from the tap slowly but the flame spreads around with horrible gluttony. 1) To make an appliance for fire fighting an element of wall design, interesting element. 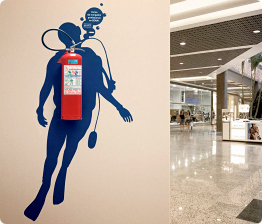 2) «Upgrade» fire extinguisher. Here it’s sandpaper, paint, laquer and brush will help you. And, of course, your imagination will be the main source of the ideas. The drawing can be realized with help of self-adhesive vinyl, acrylic paint and decoupage techniques. 3) «To adjust» interior (for example, to find special wall panels) and make it matching fire extinguisher, paying attention to unusual way or place of installation. Fire security might be nice! 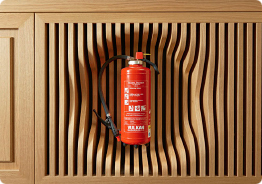 Fire extinguisher is the main facility to isolate just caught flame; it can be easily fit to interior design. 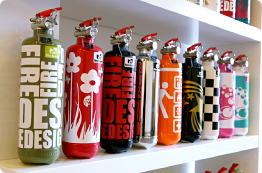 Carbon dioxide type (CO2) fire extinguisher bought at GC «Terrikom», will not only «survive» in the interior painlessly for the eye but will also add its own spice. The main thing is to turn on creative thinking.